The Australian Accounting Awards is the only national independent awards program for the accounting industry. Recognising excellence across a true cross-section of the accounting industry, the awards celebrate the contributions of both individuals and firms who are leading the way in our field. The finalist list features over 270 accounting professionals and firms so we are honoured to be represented as finalists across such a diverse range of categories. Our team at Allan Hall are and proud to be part of the exclusive network of finalists and thank all our clients for their ongoing support. Allan Hall is thrilled to announce that we have been recognised as a winner in multiple categories in the 2018 Professional Services Awards, which are proudly supported by NAB. Judged by clients, these awards showcase the best small to medium firms. Each firm was rated on their Expertise, Reliability, Communication and Understanding of client needs, as well as a host of key drivers of client satisfaction. The best firms were determined by a combination of a weighted average of client satisfaction metrics, sample size and sentiment analysis of qualitative comments. As these awards are based purely on client feedback, Allan Hall is honoured to be recognised as winners in the following categories and would like to thank all our clients for their ongoing support. Allan Hall is excited to announce that we were recently selected as a finalist in four categories at the prestigious SMSF and Accounting 2018 Awards, with Client Service Manager, Michael Bowman awarded SMSF and Accounting Professional of the Year for the Metropolitan region. The first of its kind, this nationwide industry event recognises state based performance in SMSF and accounting professions across Australia. Now on its second year, the SMSF and Accounting Awards continues to honour the individuals and businesses who are leading the way in SMSF advice and accounting by championing professionalism, quality advice and innovation. Allan Hall is honoured to be a finalist for multiple categories (below) and particularly proud of Michael Bowman’s recognition as the winner for SMSF and Accounting Professional of the Year in the Metropolitan region. Given the calibre of nominees and competitiveness of the event, these awards are a testament to the level of professionalism and quality of the services that we provide, recognised by clients and industry professionals. For a full list of the winners of the SMSF and Accounting Awards for 2018 please click here. Consultum Financial Advisers recently awarded Robin Bell, Allan Hall Financial Planning Advisor with the prestigious “Rising Star” Award at the annual Conference. The accolade, which is awarded to advisers with less than five years financial practice in an advisory role, was presented in November 2018 and recognised Robin for his breadth and quality of advice, compliance record, as well as industry qualifications. This award was one of four presented across a variety of categories that were developed to recognise financial advisory practices who demonstrate exceptional qualities in areas including quality of advice, adherence to training and compliance policies, and leadership. Leading mortgage group Custom Equity has recognised its top-performing brokers at an awards ceremony and dinner during its national conference over 3 days at Cape Schanck Resort on the Mornington Peninsula. 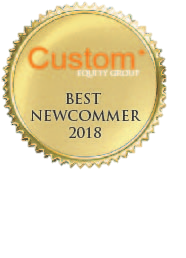 We are very proud to announce that mortgage broker, Mitchell Cleary from the Allan Hall Finance Team has been announced as Best Newcomer for 2018. CEO David Haythorn commented that the awards were the most competitive in the aggregator’s history, with a number of broker members “vying” for the top spots in each category. “As a group we have achieved outstanding success over the past year,” Mr Haythorn remarked, adding, “our broker members are setting new benchmarks for the group and the winners exemplify how to run a successful finance broking business through their dedication and hard work”. Industry newcomer Mitchell Cleary, was one of the biggest winners on the night, named Best Newcomer of the Year for his efforts over the past year. We congratulate Mitchell on his achievements which is a testament to the value that he provides to his clients and the Allan Hall community. Allan Hall Business Advisors again made the finals for the third year running in 2018 with our Partner, Scott Somerville nominated as Most Client Focused Accountant. In 2017 Scott Somerville was awarded as the ‘Most Client Focused Accountant’ in Australia and New Zealand, and in 2016, Allan Hall Business Advisors took out Best Accounting firm in Australia and New Zealand (revenue < $50 million) and overall winner of the Best Professional Services Firm in Australia and New Zealand (revenue < $50 million). To gain repeat recognition in this field reaffirms our focus on delivering trusted advice, which is highly received by our clients. These highly prestigious awards celebrate excellence in professional services and include accounting, law, management, consulting and engineering firms in metropolitan and regional areas across Australia and New Zealand. Our selection as a finalist and previous winner was based on feedback provided by a random selection of our clients who were approached by independent researchers, Beaton Research. In a time where accounting firms are facing many challenges and threats, this is an outstanding acknowledgement by our clients of the work that we do. We have a very strong culture at Allan Hall Business Advisors where valued relationships, problem solving, quality, value and communication are all paramount and it is hugely rewarding to know that our services are so well received, respected and valued by our clients. We thank our clients for their valuable feedback and acknowledge our highly dedicated staff, as these awards are a testament to the service provided by our entire team. Mark O’Connell, who heads up Allan Hall Financial Planning was awarded “Consultum Adviser of the Year” at the annual Consultum Conference in October 2017. These awards recognise outstanding individuals and financial planning practices who demonstrate exceptional qualities in areas such as compliance, training and development, and going the extra mile in providing professional financial advisory services to their clients. Mark attributes the award to the entire Allan Hall Financial Planning team were also finalists in the financial planning practice category of the 2017 awards.